^ Newsstand on-sale date April 25, 1940 per: The first ad for Batman #1. DC Comics. [2006-10-23]. （原始内容存档于2006-10-19） （英语）. ^ Eason, Brian K. Dark Knight Flashback: The Joker, Part I. Comic Book Resources. 2008-07-11 [2014-02-23]. （原始内容存档于2014-02-23）. ^ When Is Batman's Birthday, Actually?. MTV News. [2018-06-05] （英语）. ^ O'Neal, Sean. R.I.P. Jerry Robinson, creator of the Joker. News. [2018-06-05] （美国英语）. 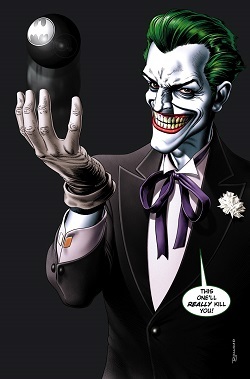 ^ DARK KNIGHT FLASHBACK: The Joker, Part I. CBR. 2008-07-11 [2018-06-05] （美国英语）. ^ The man who was The Joker. Den of Geek. [2018-06-05] （英语）. ^ Rocket Llama Headquarters – Home Base of Alex Langley- Author, Journalist, and All-round Awesome Dude. www.rocketllama.com. [2018-06-05] （美国英语）. ^ Batmania 14 (Batmania) - Comic Book Plus. Comic Book Plus. [2018-06-05] （英语）. ^ Gustines, George Gene. The Joker in Jerry Robinson’s Deck: Birth of a Supervillain. The New York Times. 2010-10-04 [2018-06-05]. ISSN 0362-4331 （美国英语）. ^ "He Made Batman, No One Else. Kane Had Nothing To Do With It. Bill Did It All" - Carmine Infantino On Bill Finger - Bleeding Cool News And Rumors. Bleeding Cool News And Rumors. 2013-08-12 [2018-06-05] （美国英语）. ^ Staff. Top 100 Greatest Villains. Wizard Magazine. July 2006, 1 (177). ^ The Joker is Number 2. ^ The 50 Greatest Comic Book Characters. Empireonline.com. ^ THE 200 GREATEST COMIC BOOK CHARACTERS OF ALL TIME. Wizarduniverse.com. 2008-05-23. （原始内容存档于2009年10月3日）. ^ The 100 Greatest Fictional Characters. Fandomania.com. [2010-05-21]. ^ 345552_FINAL_Publicity.jpg (image). 2.bp.blogspot.com. [2010-12-29]. ^ Batman Ninja Anime's English Trailer Reveals Dub Cast, Home Video Release. Anime News Network. 2018-02-13 [2018-02-13] （英语）. ^ バットマンが戦国時代で剣を振るう？叶姉妹も「突っ込みどころ満載」と魅力語る. Comic Natalie. Natasha. 2017-12-01 [2017-12-01] （日语）. ^ Game Informer features a two-page gallery of the many heroes and villains who appear in the game with a picture for each character and a descriptive paragraph. See "LEGO Batman: Character Gallery," Game Informer 186 (October 2008): 93. ^ KHI and FXN - Otakon 2008 Feature!. Kingdom Hearts Insider. [2008-10-13]. （原始内容存档于2008年10月27日）.